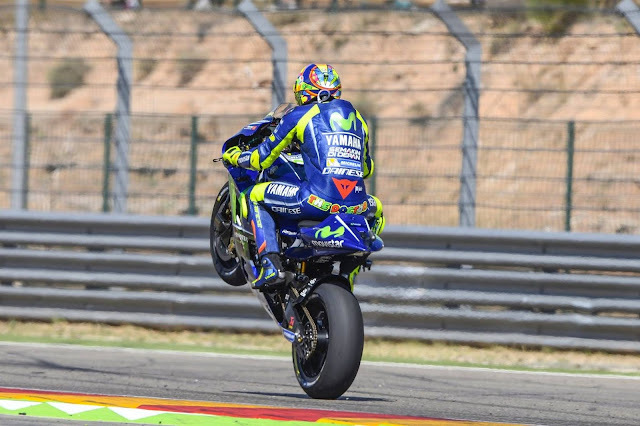 Home 2017 AragonGP motogp sports Valentino Rossi "I hallucinate with all the pilots, and with Valentino more"
"I hallucinate with all the pilots, and with Valentino more"
Doctor Angel Charte, MotoGP medical chief, said goodbye to the Italian with a hug and happy for the gesture he made in Aragon. A question hovered over Alcañiz's paddock after the MotoGP race, the same one in which Rossi was able to finish fifth, five seconds behind Marquez, just 24 days after the tibia and fibula of his right leg had been broken while practicing enduro training. How is it medically and humanly possible for him to do such a thing? Doctor Ángel Charte, MotoGP's medical chief, has the answer, which does not mean that a part of him would also hallucinate with the gestation carried out by El Doctor in the GP of Aragon. "Medically he explains what he has done because of the Italian surgeon, Pascarella, did an exceptional job. That is the first of all. Twelve hours of the operation, Valentino was already rehabilitating. That is something that surprises us, of course, but it is that in the world of motorcycles we are surprised many things because they are special people, and nothing more, "says Charte, who has been present in Rossi's box during the end of week, and explains the method of work that has been followed, without the need to infiltrate: "An anti-inflammatory and physiotherapeutic treatment has been carried out. No infiltration was necessary. Analgesics, rehabilitation, and physiotherapy. Valentino has not been infiltrated at any time. " Another question that arises is whether the effort to which he has submitted the Yamaha to his leg could take its toll in the coming days. Charte says emphatically that "no, on the contrary. It's going to be better. The results of this weekend are evident. " What Rossi did recognize was that the second part of the race was more tired and it was seen that it lost some bellows, although it sold face to face both Pedrosa and Maverick. In that sense, the Galen thinks that "23 laps are many laps. I hallucinate with all the pilots and with Valentino more, for the age that has and the capacity so strong that it has to evolve positively. The physical strength he has is incredible, and also psychological. In equal parts? No, there is a physical part that breaks down for the fracture and he solves it and recovers it mentally, getting the best of the part that has more positive in that aspect. The farewell between the two in Alcañiz was affectionate and Rossi thanked him for his attention. "I have given him a hug and I have told him to continue the rehabilitation and in Japan, he will be 100%," Charte told this newspaper before settling for the transoceanic tour of Japan, Australia, and Malaysia.